5/27/2008Share this story on Facebook! Grab a seat, put on your headphones, and hear sample cuts from our four featured bands. Want more? Check out these official websites for more music, videos, and photos. Here are some other talented musicians making their mark on the Ithaca music scene. The Ithaca Conservatory of Music was founded in 1892 and later expanded into what we now know as Ithaca College. In a city known for grassroots festivals and spontaneous jam band music, the College routinely turns out top-notch musical talent -- and not just from the music school. IC students are also forming their own bands, setting up their own gigs, and burning up the stage with their original music in Ithaca and beyond. Now seven members strong, the Rozatones bring the smooth sounds of songs like “Weapons of Control” and “Stop Right Now” to the local scene. Roza writes most of the lyrics, but everyone contributes to getting the rhythms and horn lines right. What do they do when they get stuck? “Play it live and see what happens,” says drummer Byard Duncan ’09, a politics and political science double major. Summer 2008 update: The Rozatones appear on national television! Anthropology major Evan Friedell ’08 transferred to IC his sophomore year with the intention of getting back together with former high school bandmates Packy Lunn ’07, an OCLD major, and Aaron Gorsch. Adding a fourth member, sound recording technology major Dave Rossi ’09, they formed Jimkata, whose music Friedell describes as “rock with a little reggae vibe and some hip hop influence.” Musical influences include Frank Zappa, Phish, and Talking Heads. The band composes their songs together. “Usually it’s a musical idea, like a riff or a chord progression,” says Friedell, who is lead vocalist and guitarist. “Lyrics come in last.” The group typically practices three times a week, but Friedell explains, “It’s hard to balance everything because people have work and school. Now we’re playing more often and out of town.” Jimkata plays at local venues like Castaways and the Nines, and more recently, in Albany, Syracuse, and Oneonta. Igor’s Egg lists Astronon, Frank Zappa, and Pink Floyd among its musical influences. 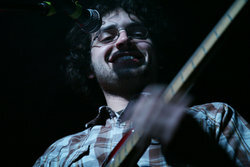 As a solo artist, Ted Rosedale ’09 released his first album, Home, in November 2006. Rosedale, a business administration major, says his album was originally just a collection of songs that turned into a larger project when he got picked up by New York City–based record label Nest Egg Music as their first artist. “My music is a flashback to the ’60s and ’70s,” Rosedale says. “But you can hear some newer wave music in it.” Rosedale sings and plays several instruments on his album, including guitar, drums, bass, piano, tambourine, and ukulele. i think it is unfortunate that so many kids today listen to their parents' music. Isn't Nest Egg Music a label that Ted Rosedale's father started to promote his son's music?